Should I Choose an Electric or Gasoline Pressure Washer? In your quest for cleaner surfaces you have officially decided to purchase a pressure washer, the ultimate solution to the many challenging surfaces you may face! Now that you decided to purchase, the next question is, what type do you get? There are a few differences among the many brands of pressure washers, however, the most prevalent is the amount of power they produce. As with any tool, there is a specific application for each. The amount of power produced by a pressure washer can be lumped into two general categories, industrial and residential. You can further break these categories down depending on your use intentions. Industrial pressure washers can be used on a daily basis, provide more power, and are very durable. Residential pressure washers are typically used less frequently, have slightly less power, and can be used on almost any surface without damaging anything. You are most likely to purchase a residential type washer, which still leaves you with a few more questions to answer. The first question is usually, how much power do I need in a pressure washer? The amount of power you’ll need depends on the type of surface you plan on cleaning and the length of time you intend to use the washer. So now your question should be, electric or gas pressure washer. As you may imagine a gas-powered pressure washer will produce more power than an electric, however, more power may not mean it’s the best tool for the job. This is the fundamental difference when it comes to a washer, gas powered vs. electric powered. Gas powered pressure washers are often long-lasting machines that produce the most power. Because they are built to handle highly pressurized water, the parts and components are made of durable metal and plastics. This construction allows the gas-powered washer to stand the test of time. A gas washer is highly portable and will give you a greater range of use, however, depending on your own physical strength this may be a limiting factor. A gas washer is heavier than an electric, so depending on whether or not you can lift it is what determines it’s actual portability. A gas-powered machine also lends itself to daily use, standing up to the tough jobs you have in store. This means it is a reliable tool for larger projects throughout the year. If you have heavily soiled surfaces that need cleaning a gas washer will power right though the dirt and grime! Gas washers can provide much more power which means it will make your job faster and easier. This power doesn’t mean you can’t use it on a more delicate surface, you’ll just need to use the appropriate accessories and keep in mind the various washing techniques used in safe washing. On the other hand, a gas pressure washer will dig a bit deeper into your wallet. Because of it’s construction and overall power, a gas washer has a higher price tag. This should not deter you from making the purchase though, as it will most likely last longer than other types. Because a gas-powered pressure washer is powered by an internal combustion engine, you’ll obviously have to maintain it as such. Keeping an eye on fuel and oil levels will need to become a part of your maintenance routine. Something you may not think of at the time of purchase is winterizing the engine. This will need to be done each winter or whenever the washer sits idle for an extended period of time. Winterizing the washer means you need to remove any water from inside, and add a fuel-stabilizer to the gas. This will ensure no damage is done by cold weather, and help your washer last longer. If you’ve seen a driver broken down on the side of the road, you know that engines are prone to break down once in a while. A gas-powered pressure washer is just as susceptible to breakdowns as a car, something to keep in mind when making your choice. Gas powered washers are very reliable, but you should know that a breakdown is a possibility. 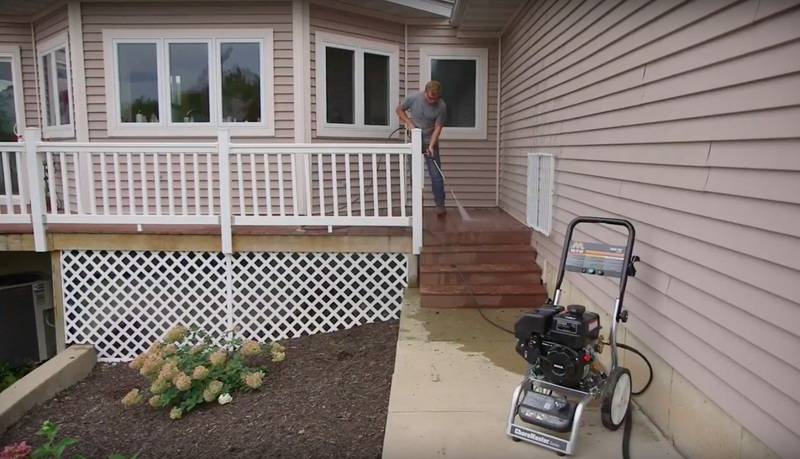 An electric powered pressure washer can serve as an affordable and effective washing tool. Electric washers tend to cost less than gas washers, and be as effective as a gas-powered washer. These washers are ideal for intermittent use, and do very well when used on vehicles, patios, home siding, and other small projects. The majority of electric washers are light-weight, which lends them to easy use by a full range of operators. If you live in a quiet neighborhood the last thing you want to do is disrupt the peace with a loud noise. The beauty of an electric washer is how quiet and non-invasive it is. The amount of noise pollution you’ll emit is extremely minimal, something your neighbors will appreciate! A few drawbacks of the electric pressure washer are primarily in relation to it’s range of use. Manufacturers advise against using an extension cord with an electric washer, which limits your range when working around the house. If you want to pressure wash a fence, you’ll be limited to using the nearest power source. Since these washers aren’t built to handle extreme pressure they are usually constructed with various plastic parts. This means that they will wear out over time, so you may save money up-front but end up needing to purchase another in the coming years. As you can see when it comes to a gas or electric pressure washer, each has its own distinct advantages and disadvantages. The best thing you can do when deciding which type to purchase is think of the projects you want to work on. From there your decision should become much easier.